Trees and shrubs are a common part of most Australian yards. But so are power lines as well. And trees and power lines don’t make the best friends. If trees come in any contact with a power line, they can cause electricity disruptions or cut off the power. As a result, you may have to pay the power company for damages caused by your trees or branches. However, a disrupted power supply is the best case scenario if a tree comes into contact with a power line. Other scenarios are far more serious. Considering how a tree can carry electricity through its branches and trunks, any person or animal coming into contact with it will be immediately electrocuted. What’s more, if a tree were to fall on a power line, it can snap it in half or uproot the supporting poles, which can easily lead to a fire. If you want to avoid all these scenarios, it’s best to hire professionals to do a powerline clearing of your property. As working near power lines can be extremely dangerous, it’s advisable to hire tree surgeons accredited by ActewAGL to take care of business. ActewAGL certified professionals will do all the necessary paperwork for you and arrange a “shutdown” of power with the electricity company. The experienced arborists will use the best pruning and cutting methods to encourage trees to grow away from electric wires. What’s more, they can simultaneously inspect the health of your trees and make sure that they are free of infection and disease. They will also try to create the most aesthetically pleasing result as possible. A professional powerline clearing service can also ensure that your trees remain at a safe distance from power lines for up to 5 years. If the distribution powerline is uninsulated (bare), 3m is usually the closest distance to which a tree can grow safely. However, if the power lines are uninsulated, trees may grow up to 1m close to them. In the case of bushfire areas, it’s advisable to keep a 5m clearance between trees and power lines. Once the powerline clearing is done, the professionals can clean up the mess by removing the debris from your property, or by turning it into mulch or leaving it as timber for you to use. Sometimes, even if your trees are growing at a safe distance from power lines, powerful storms can break them off and send them flying into your powerlines. 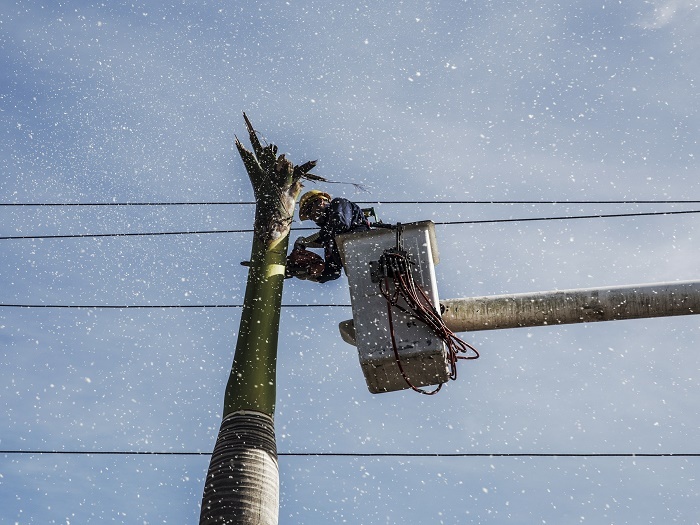 When the storm finally clears, you should immediately call an expert tree service for an emergency power line clearance. When you’re dealing with electricity, it’s always best to leave it to the professionals!